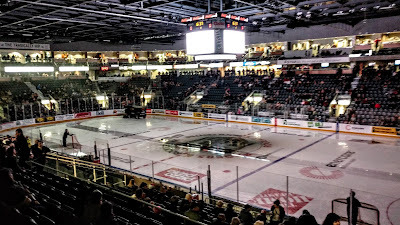 It's hockey playoff time and although I am not planning on attending any NHL games over the next couple of months, I do follow other league schedules just in case a game appears close to where I might be. 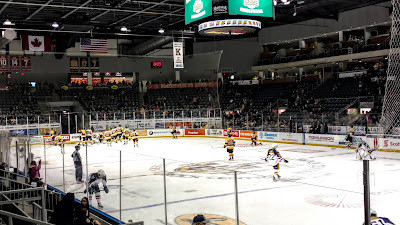 Last weekend I was in Belleville for a family visit, and so I was keeping an eye on the OHL playoffs to see if the Kingston Frontenacs would be home around the same time. When the second round schedule was announced, the Fronts were set to host Game 6 against the Barrie Colts on Friday, the day I planned to arrive in Belleville. 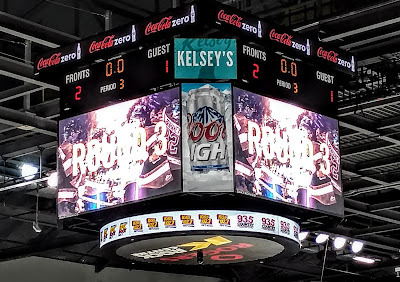 When Barrie won the first two games at home, the chances for a sixth game looked slim, but Kingston won the next three in a row to reward their fans (and me) with another home battle. It was a rainy evening, a precursor to a weekend ice storm that would invade Southern Ontario, but that didn't stop my dad and I from making the short drive down the 401 to Kingston. 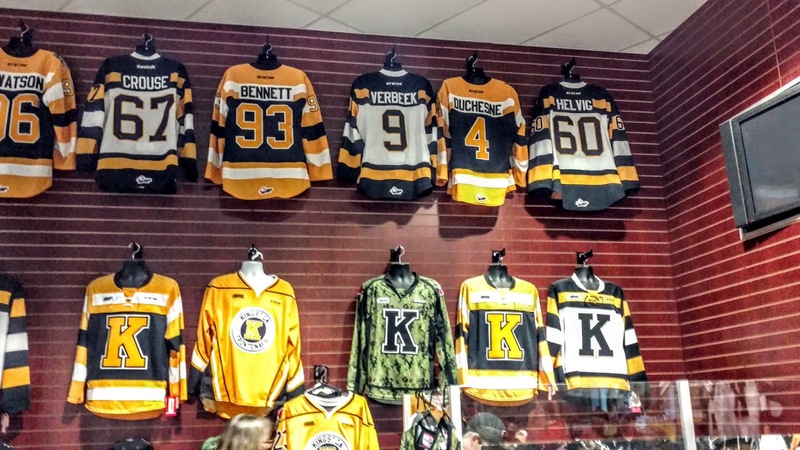 The Frontenacs play out of Rogers K-Rock Centre, yet another venue with naming rights owned by the Canadian communications giant (the hockey arenas in Vancouver and Edmonton, plus the dome in Toronto all carry the Rogers name). Opened in 2008 and known only as the K-Rock Centre (after a local radio station) until 2013, the arena is located downtown on Tragically Hip Way, named after the iconic Canadian band that hails from Kingston. Street parking is your best bet as it is free in the evening, though there are plenty of lots around charging $4 or so. With a capacity of 5,614, you can expect 2,500 cars in the area for a playoff game, so get there early to secure a spot close by. Not that Kingston is a large city, but in cold and wet weather, the less time spent outside, the better. As the rain was falling quite heavily, I did not wander around outside for an exterior shot, instead heading straight for the box office, which was enjoying a brisk walk-up business despite the weather. Tickets were $24 and I ended up getting a pair down low near the face-off circle (view above) and walked in. 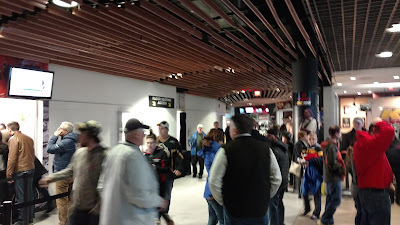 The concourse was crowded as you would expect, with fans mingling, but there was still room to walk around and so I completed the obligatory tour. 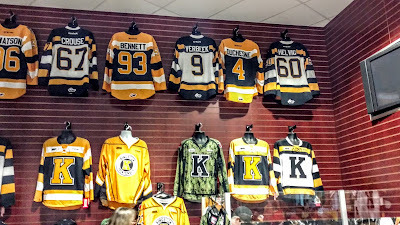 The team shop had a good selection of jerseys and as you can see, the Frontenacs use the colours of the Boston Bruins, with a giant K on the front, though having 3 front-facing jerseys in a row may be taken the wrong way. 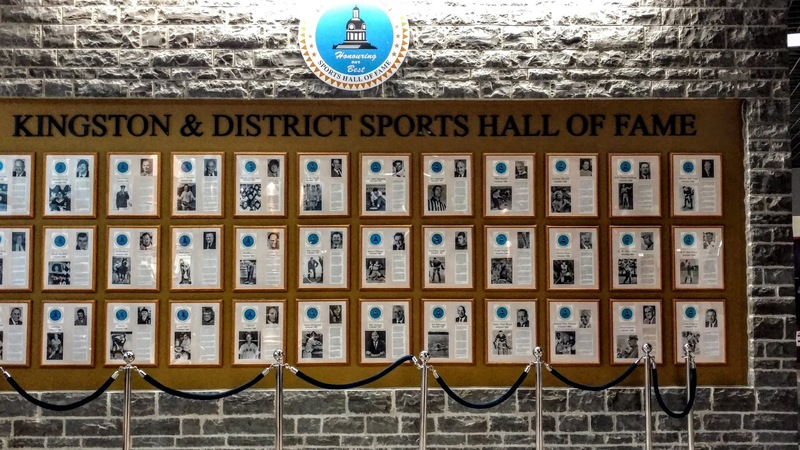 At the south end of the concourse, you will find the Kingston & District Sports Hall of Fame, which continues along the back walls with detailed descriptions for each inductee. 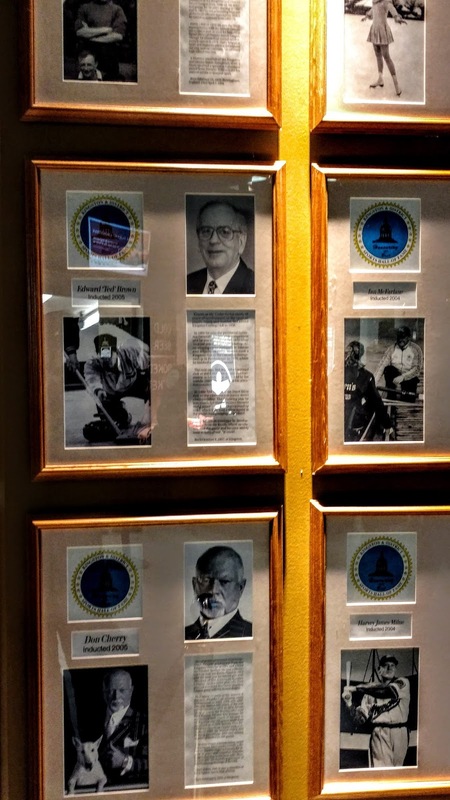 Don Cherry, who was born in Kingston, is one notable face that can be found. 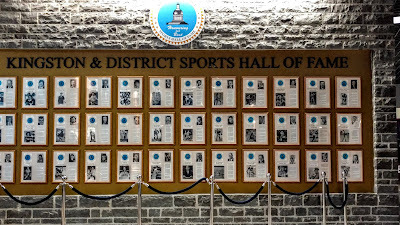 As it was crowded with fans standing in front of some of the plaques, I was unable to get a full accounting of the list of enshrined. The franchise used to be known as the Canadians and you can see some old retired numbers inside the rink that use the Habs colours, along with newer banners in the black and gold. 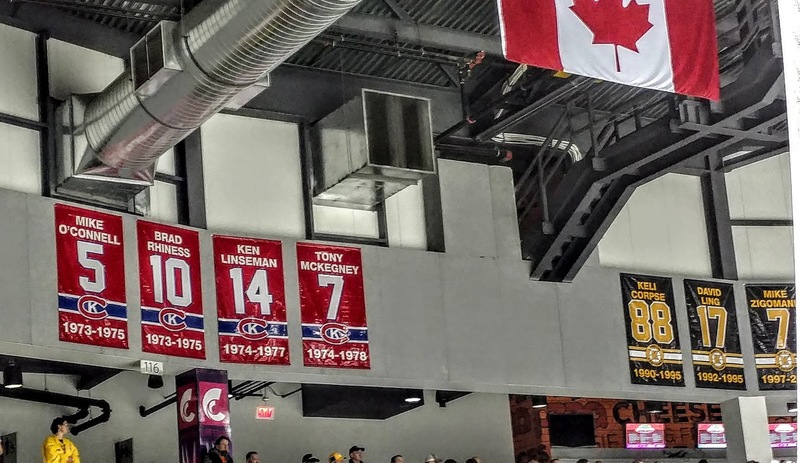 Ken Linesman and Tony McKegney are two former NHLers that are honoured here. There is a single seating bowl with suites above. 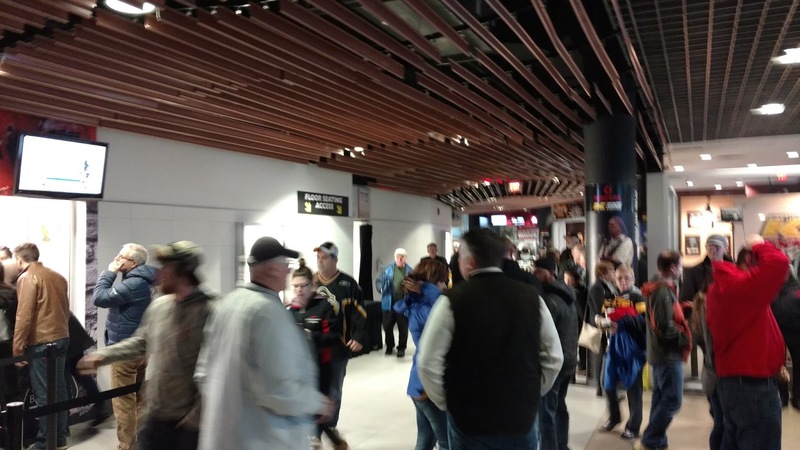 The entrances from the concourse are down low, so you have to walk up to get to your seats. As is usual, you have to wait for a whistle before returning to your seat. There is also a standing area above the top row with a drink rail that was used by several fans. In the top rows behind the net, there are 23 seats in a row, but legroom is quite good for a rink this size and you shouldn't have much trouble getting back to your seat without disrupting fans around you. 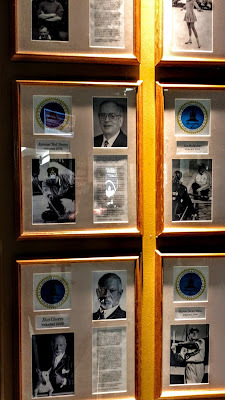 The drink rail is visible behind the top row in the picture below. On one side of the building the upper rows of the sections between the blue lines are part of a club lounge and you can't get in without a ticket. 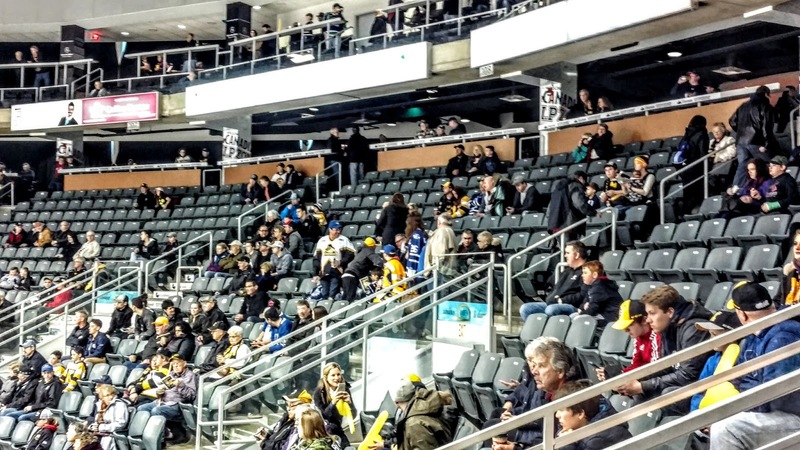 However, the lower rows are open to the public, which is important because too often club seat holders care less about the game and it affects the atmosphere. 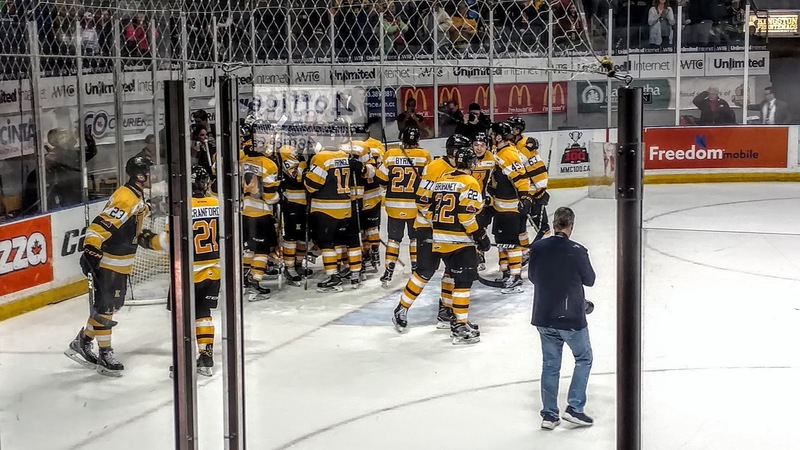 That was not a problem here on this night as the fans were out in full force, hoping to cheer on their Frontenacs to their first league semi-final in 25 years. 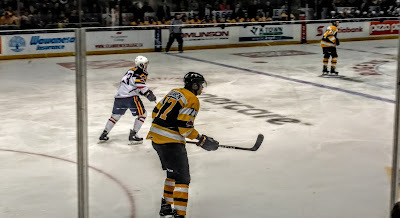 The teams had played the night before in Barrie with Kingston winning 7-1 to take the series lead, so I expected the Colts to put up a good fight, but they only mustered 5 shots in the first period and yielded the only goal when Brett Neumann poked a loose puck behind a sprawled Leo Lazarev. 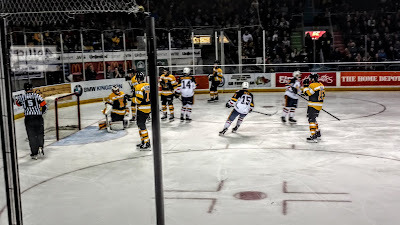 Early in the second period, Barrie tied it when Aaron Luchuk snapped a shot past Jeremy Helvig (5th round pick by Carolina in 2016) but a fluke deflection on a pass from Ted Nichol gave Kingston the lead with just over a minute to go in the period. 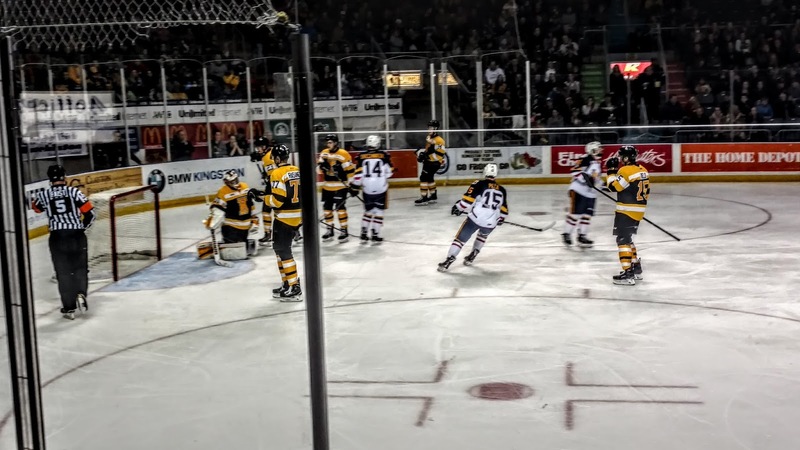 Barrie dominated the third, outshooting the Frontenacs 15-5 but Helvig was equal to the task, including making a spectacular save in the final minute to preserve the 2-1 win and complete the upset. The highlights (including that amazing save) are here for those who are interested. It was a very entertaining game and good to see the Frontenacs advance to the Eastern Conference final against Hamilton. Update: they lost to the Bulldogs in 5 games. Kingston boasts Leaf draft pick Eemeli Rasanen (2nd round in 2017, below), a lumbering defenseman from Finland who stands 6'7 but weighs "only" 226. He'll have to bulk up and work on his skating skills as well, but he just turned 19 so has some time to improve. If so, you can expect to see his booming shot in Scotiabank Arena in a few years.